Glock has recently introduced a new pistol with a distinctive character. The pistol is a 5th Generation Glock with important improvements over earlier Glock pistols. It is configured in a similar manner to the Glock 19X but differs in important particulars. 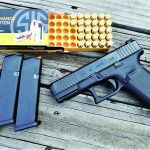 In some ways the Glock 45 chambered for the 9mm Luger may be an improvement over the Glock 19X but it may depend on your needs. 115-, 124- and 147-grain SIG Sauer Elite loads were fired with good results. The pistol comes with three 17-round magazines. The Glock 45 is better suited to police agencies than the Glock 19X, in my opinion. While each shares common parts and capability, the Glock 45 has features I like. The Glock 19X has been called a Glock style Commander. The 1911 Commander features a shortened barrel and slide and full size frame. The Glock 19X features a full size Glock 17 frame mated to a Glock 19 slide and barrel. The result is a handgun that fills the hand well and holds a full seventeen round magazine. The shorter slide clears the holster well and handles quickly at close range. The Glock 45 is similar to the Glock 19x as it also uses a short slide and full-size frame. In rapid fire the Glock 45 9mm pistol is controllable. Speed to an accurate first shot is good. The Glock 19X represents changes to the Glock including the elimination of finger grooves in the front strap. The Glock 19X has the marksman’s barrel and ambidextrous slide lock of the Generation 5 pistol. The new pistol garnered a great deal of interest from law enforcement. One feature that did not impress our LEOs was the dark earth finish of the Glock 19X. The G45 is in some ways a black 19X. This is a rapid fire group at 10 yards. 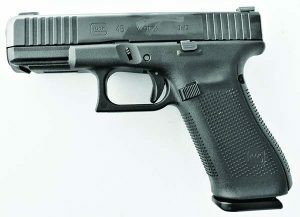 The black G45 has the standard hard coating applied to all Glock pistols. This coating is proven in hard use and is probably the most durable finish offered with any service pistol. The pistol has the grip of the 19X without finger grooves and an aggressive grip pattern that offers excellent adhesion and abrasion. 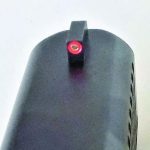 I have tested and used the Glock 19X without issue; however, some have found the magazine extraction cutout in the bottom of the handle presents a problem. Some have pinched fingers. The new pistol features an enlarged and flared magazine well and no cut out. I found the G45 design is quite fast and offers excellent speed in loading for those that practice. The pistol was fired with a good mix of personal defense loads. There were no hiccups of any type. 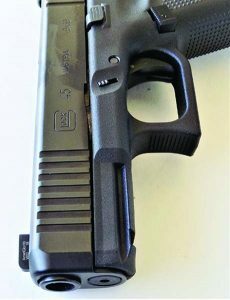 The G45 features an ambidextrous slide release. The flat magazine release is well designed for speed loads and unlikely to be actuated inadvertently in the holster. The most noticeable visual addition is the well designed and effective forward cocking serrations. For checking the chamber and cleaning the chamber, these serrations are a welcome addition. The Glock 45 9mm also features the Generation 5 Marksman barrel. Compared to older Glock pistols I detect a bit tighter fitting of the barrel hood, and the new pistols are clearly more accurate than previous Glock models. The trigger action of the G45 breaks at a clean 5.4 pounds on the Lyman digital trigger pull gauge, easily within Glock standards. The G45’s forward cocking serrations are a good addition. An important advantage of the G45 is a newly designed night sight. Self-luminous iron sights with Tritium inserts are an important part of a service pistol package. Trijicon’s HD sights feature twin rear dots and a bold orange front dot. These sights are superior to the three-dot types found on the Glock 19X and a Glock 17 on hand for comparison. These sights offer an excellent sight picture in daylight or dim light. The pistol is supplied with a total of three magazines and grip inserts as well. The grip inserts would allow an individual with large hands to use the pistol well. I used the pistol as issued without any problem. I began by dry firing the pistol with several dozen trigger compressions. I collected a good supply of ammunition. 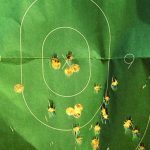 While most of the shooting was expended in combat style shooting at 7, 10 and 15 yards, I also fired a number of personal defense and training loads for accuracy. 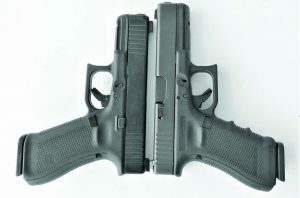 The Glock 45 9mm compared to a Generation 4 Glock 17. The Glock 45 is shorter and kicks no more than the M17, but may not be quite as accurate at long handgun range. The pistol is more than accurate enough for any foreseeable chore. In rapid fire the pistol is controllable. The cadence of fire isn’t set by how fast you may pull the trigger but how fast you are able to recover in recoil and regain the sights. The excellent high visibility sights and controllable trigger of the G45 were an advantage. The pistol gave excellent results in both rapid fire and precision fire, firing at small targets at ranges of up to 50 yards. 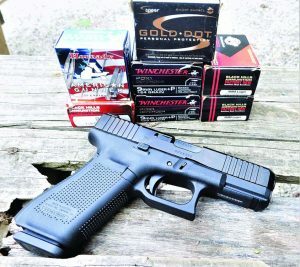 The Glock 45 proved a good performer. The pistol is service grade reliable and offers light weight, reliability and good function. The bottom line? The Glock 45 has certain advantages over the Glock 19X, Glock 19 and even the Glock 17. The HD sights are an advantage and so are the forward cocking serrations. The Glock 45 9mm may be the best service pistol Glock has yet offered. It is light enough, fast into action, reliable, and accurate. 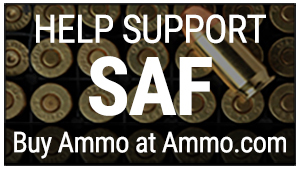 Groups are an average of two 5-shot groups fired from a solid benchrest. Black Hills Ammunition 115-gr. FMJ 1160 fps 2.6 in. Black Hills Ammunition 115-gr. TAC +P 1140 fps 2.0 in. Black Hills Ammunition 124-gr. JHP 1102 fps 1.8 in. Hornady 135-gr. Critical Duty 1030 fps 1.8 in. Hornady 124-gr. American Gunner +P 1124 fps 1.75 in. Speer Gold Dot 124-gr. +P 1148 fps 2.1 in. Federal 147-gr. HST 970 fps 1.9 in. SIG Sauer 115-gr. FMJ 1165 fps 2.0 in. SIG Sauer 124-gr. FMJ 1143 fps 1.9 in. SIG Sauer 147-gr. FMJ 980 fps 1.7 in. Winchester 124-gr. +P 1205 fps 2.0 in. Winchester USA 115-gr. FMJ 1144 fps 2.2 in. Winchester 127-gr. SXT +P+ 1240 fps 1.75 in. The HD sights fitted to the Glock 45 9mm are first class night sights and make for excellent hit probability. During the test period I carried the Glock 45 9mm in a Werkz inside-the-waistband holster. This Kydex holster is designed with an anti-rollout device that facilitates appendix carry. The Werkz claw is easily removed but should be used in appendix carry. This claw prevents the holster body and handgun from rolling out as some holsters are likely to do. In certain situations I find appendix carry the best choice, with elements of both inside-the-waistband and crossdraw as advantages. I primarily carry the piece behind my right hip as old habits are difficult to break. The holster is well suited to concealed carry. For more information, visit online at Werkz.com; phone: 855-WERKZ-01.